Killing Floor is the first book in the Jack Reacher series by Lee Child. While passing through a small Georgia town, former cop Jack Reacher is arrested for murder. Jack knows that he didn't kill anybody. But he doesn't stand a chance of convincing anyone. The Jack Reacher series is a lot different than I expected. It turns out Killing Floor is actually my style of read. I assumed these books would be more military in nature, but Killing Floor is a crime thriller that just happens to star an ex-military cop. I'm now wondering if the Stephen Hunter books are at all what I thought they were either. Killing Floor was a very fast read. I love a good page turner so I will be sticking with this series for a while. The brutal nature of the crimes were a little over the top for me, but I don't think it was more than the average reader can handle. If you are a fan of page turning mysteries, Killing Floor is a great book to check out. I can only imagine the rest of the series will prove worthwhile as well. Have you read any of the Jack Reacher series? Have you seen the Tom Cruise movie yet? I'm a fan of Tom Cruise, but I won't have the chance to check out the movie for a while. It's been ages since I read KILLING FLOOR but I did love it! I'm sadly behind in the series and have been collecting installments with plans to tackle it very soon, but this first remains my absolute favorite. I haven't seen the movie - and admit that I'm really leery of it as a Jack Reacher movie - but I'll see it when it comes out on dvd. I probably won't see it until it is on DVD either, but I'm looking forward to it. This sounds fantastic Jennifer, definitely adding to Wishlist. I like a little brutal so i'm excited. Yes, Marce! I think you would enjoy this series. 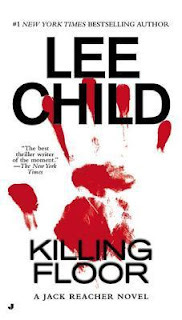 I read this book years ago after Stephen King recommended Lee Childs. I love his writing style, but sadly I still haven't made time for the rest of the series, but I need too! I didn't know Stephen King was recommending this series. I usually like what SK recommends. I might have read it faster had I known. Then again, I still need to read Dog Gone It! I'm going to add this one to my list. I like the way you describe this one. Love this series. I'm getting ready to read #9 which is the one the movie's based on. I did see the movie and thought it was okay. Tom Cruise IS NOT Jack Reacher BUT I think he did a pretty good job. The movie itself was just okay. I think you'll like this series.